The above photo was taken during a home inspection in West Vancouver in British Properties. It’s a photo of the floor drain in the mechanical room. The drain is located where all the copper pipes come together in the lower centre of the photo. The storm-water system may have backed-up into the house during a major rain event. The floor drain may be plugged with debris. Then any normal drainage, off the air conditioning for example, will create a flooded floor drain. For any prospective buyer, this condition should be identified and the implications discussed. 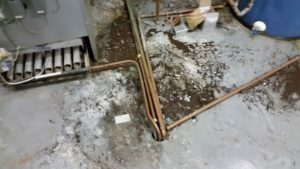 In this case there is the potential for localized flooding in the basement which may create a electrical safety hazard (electrocution) as well as damage to floor finishes and wall structures. If the drain is not flooding during the inspection to determine cause, then further review by a qualified plumbing contractor is essential. Where the homeowner is concerned about future floor drain back-up and ponding, a useful device to have in any mechanical room is a wi-fi enabled leak detector, complete with alarm function.